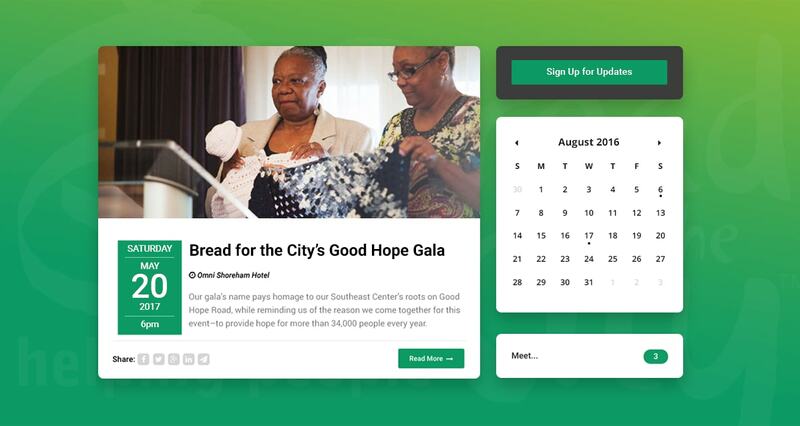 Proving the importance of an efficient content management system by helping Bread for the City's website better support and assist over 30,000 of Washington DC's most underprivileged residents. 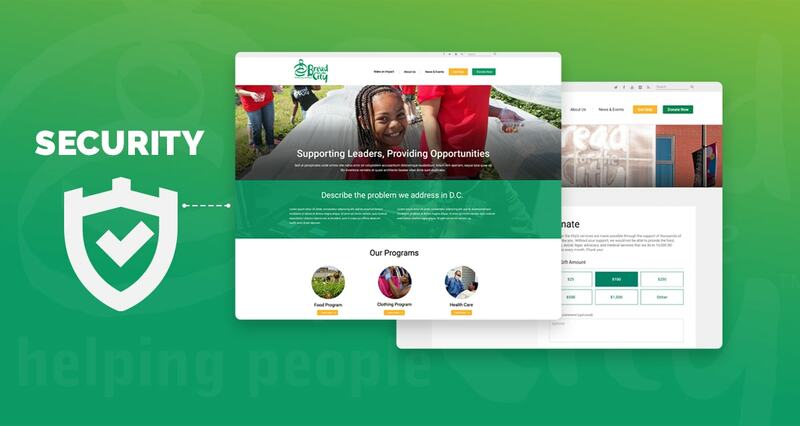 The Sabra team was honored to get a call from Washington DC nonprofit Bread for the City to help them rejuvenate their website. While the impressive number of services they offer to over 30,000 underprivileged and underserved residents of Washington DC is what makes them great, it is also the reason their website, over time, became unacceptably inefficient at getting important information across to these residents. 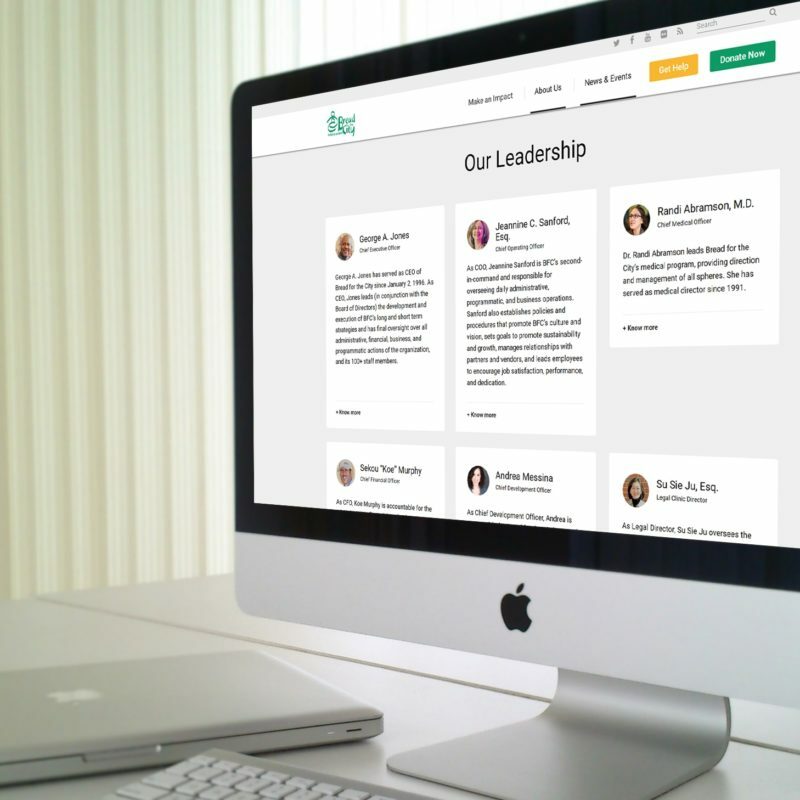 The Content Management System (CMS) of their website simply was not optimized to their specific needs, which ended up causing confusion among the several people in charge of updating the site. Conflicting and duplicate content was causing confusion among visitors. Something had to be done! Bread for the City has been around for decades saving lives and making the world a better place for people who need their services. We had a unique opportunity to help them keep up with the growing technological needs (and demands) of their users. Since 1974, the Bread for the City medical clinic has provided care for uninsured and low-income residents. The organization provides a bevy of social services, free legal representation and advocacy work for people who need it in Washington, DC. They have a clothing program that provides free clothes to people who can really use them. Their food program provides fresh and nutritious food to people living below the poverty line. 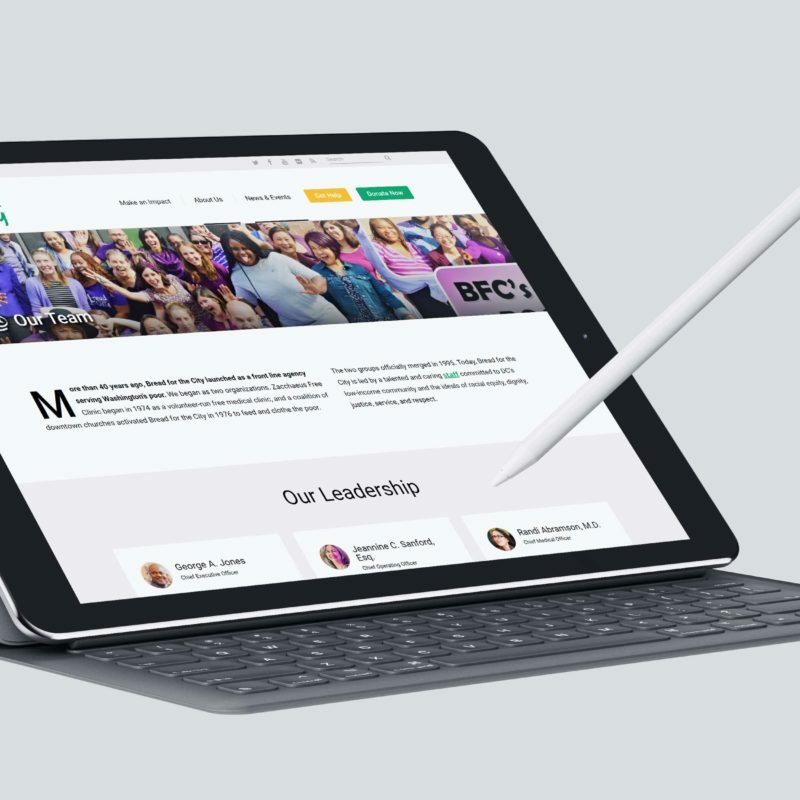 Bread for the City’s website had become severely bogged down with excessive pages and a structure that rendered updating the site unintuitive and inefficient, and the search function inoperable. This obviously hindered Bread for the City’s efforts. If people couldn’t find what they were looking for on the site, they could potentially miss out on those resources. Essentially, the organization’s site was working against it. 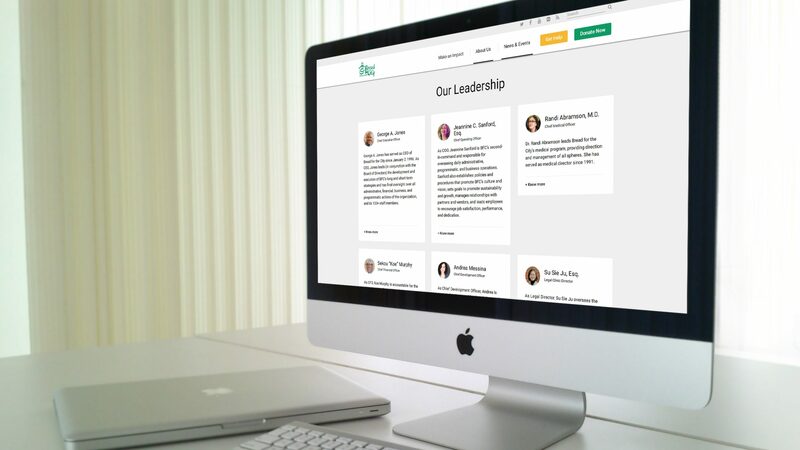 We needed to build them a website that would be simple for visitors, so they could easily find the information they needed, and for administrators, so they could easily manage content on the site. Bread for the City was given a grant to improve accessibility to their services, and improving the website was high on the priority list. 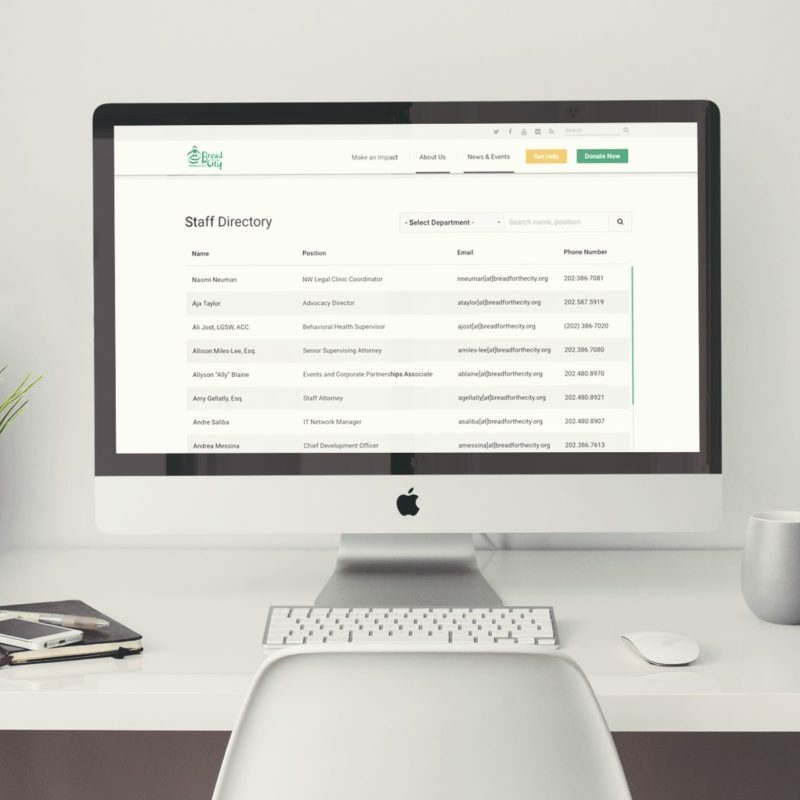 After an extensive Site Audit we managed to pare down the site from 6,000 pages (many of which were completely unused or duplicates of other pages) to around 30, and provided the organization with an easy-to-use and segmented Admin panel that allows them to keep the site’s considerable amount of content manageable. Make it easy for people who require services to find the resources they need and for potential volunteers and donors to locate and download information and forms. Prevent the content management system from getting out of hand by setting up custom User Roles, restricting access to certain features for each user and organizing content intuitively. We worked closely with Bread for the City staff from June 2016 to June 2017 to produce their new website. This wasn’t just about making the site look good and easy to use for visitors. We had to understand Bread for the City’s workflow so we could design the CMS Admin panel of the site to accommodate their needs. 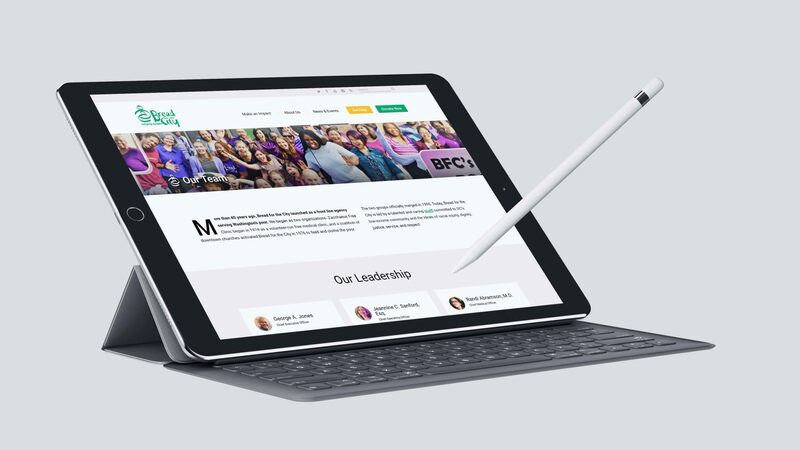 We built several custom features for Bread for the City’s website, each with the goal of improving the experience of both visitors and administrators alike. Being a charitable organization, Bread for the City obviously relies heavily on donations. 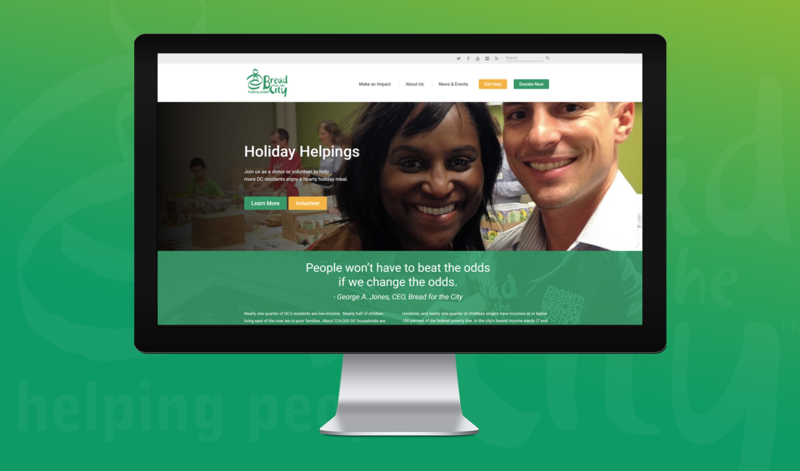 We streamlined the donation process on their site and created the “Other Ways to Give” page to present multiple avenues for people to donate to their worthy causes all in one place. A “Donate Now” button is always visible to all visitors to the site. 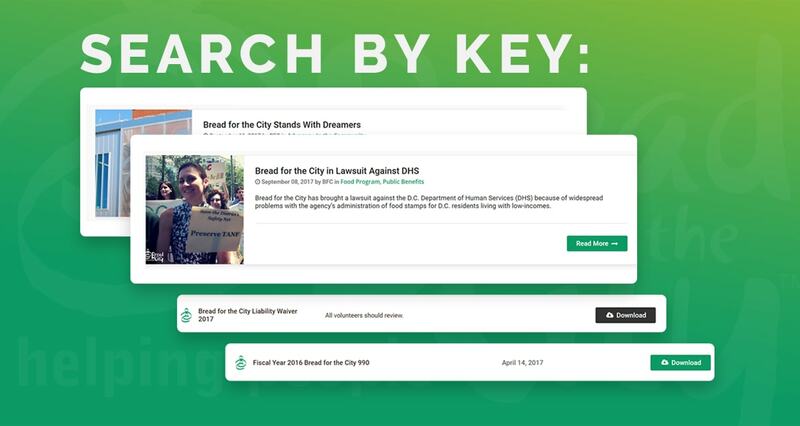 The custom search function we built for Bread for the City’s website locates and displays blog posts, news, event listings, information pages, documents, and forms from across the entire website and clearly labels them in the search results. All files, PDF forms, and newsletters are downloadable directly from the search results page. Using User Roles, we segmented the Admin panel of the events manager so that the various departments can only add events to their own pages, which helps cut down on confusion and incorrect listings. Thanks to the powerful calendar function we created for the site, recurring events can now be listed and managed easily whereas before, the staff had to manually input each event in the series, which was terribly inefficient. Users can also easily get directions to any event, directly from the website. Bread for the City has an amazingly dedicated and extensive staff. 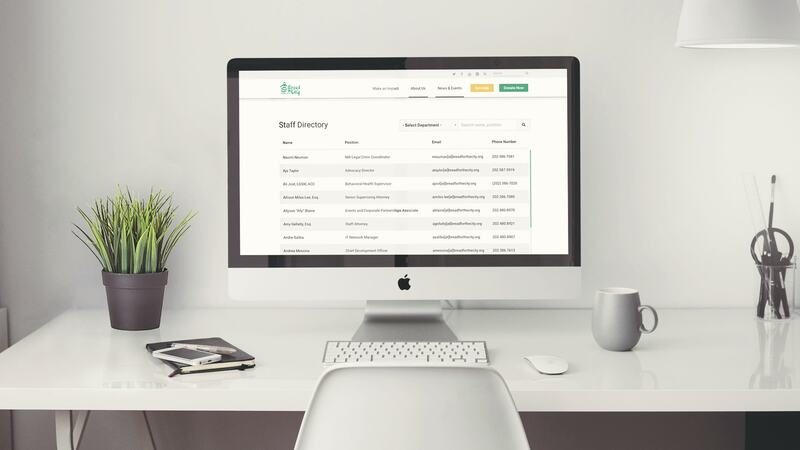 To help residents reach specific staff members, we created a powerful staff directory that allows for searching staff by name or department. Bread for the City can easily manage this Directory using the CMS. Volunteers are a huge asset to Bread for the City, so it makes sense to make it as simple as possible for would-be volunteers to find the information and documentation they need to work with this amazing organization. We created a document repository for the nonprofit’s many volunteer forms. Finding and downloading them (even directly from the main site search results) is now effortless and straightforward. This has had a very positive impact on Bread for the City’s ability to recruit volunteers. Prior to our involvement, Bread for the City’s staff was unsure of the status of their site’s security. We liberated them from that growing stress, making every page on the website secure by default with an SSL certificate (a feature we offer for free to all our web clients). This ensures that every Donation form they set up is secure and increases users’ trust in using the website to donate money. 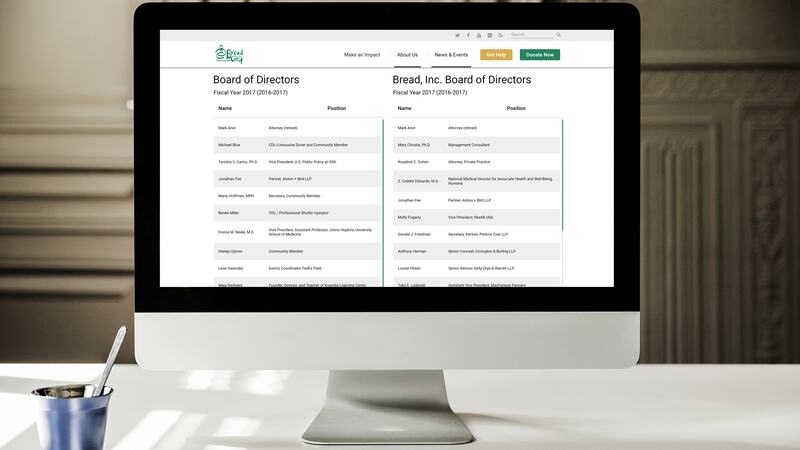 We helped to consolidate Bread for the City’s MailChimp mailing list and provided consultation on how to effectively organize their mailing list of 30,000+ subscribers. Now, the site features one-button sign up and provides subscribers with a choice of available mailing lists to join. Their mailing lists are now much easier to sign up for and manage. 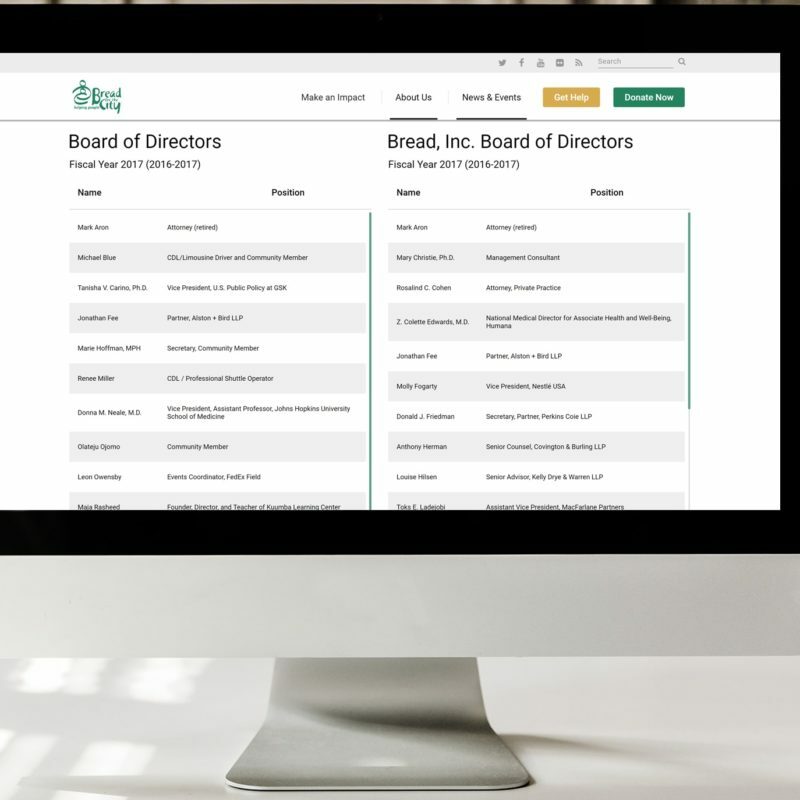 Now that the website is live, we have now transitioned into a role of support to Bread for the City’s staff as they use the new tool at their disposal. From the original launch date, we have worked closely with them to upgrade and tweak the site to best serve their visitors. 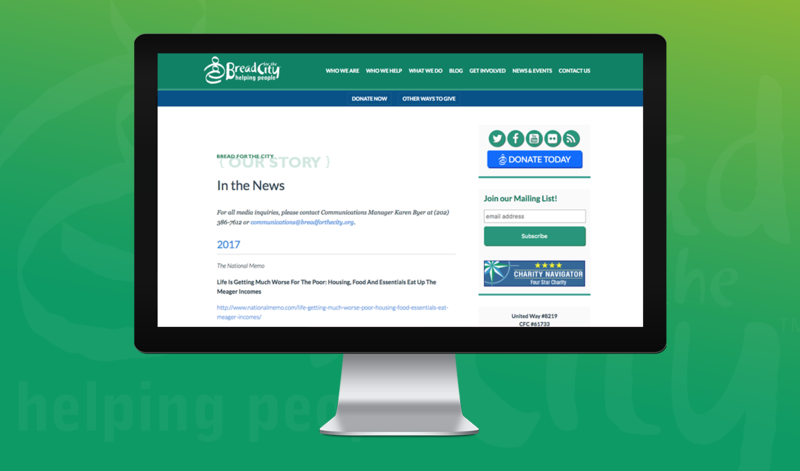 Newsletter subscribers have nearly tripled, donations have increased, and most importantly, the Bread for the City staff now feel like they have control over their website in a way that they can use it to bring about positive change to the community. Ready to take control of your website and make it work for you? Questionnaire and let’s get started!